When a new product is being launched, one of the most important tasks is clear communication of the benefits of that product. Anyone who has been involved in such a launch, and many who have not, will recognize this statement as a truism. However, even if that communication is successful, with consumers believing that your product is appropriate for them and triggered to purchase the product, countervailing forces may be at work. It is all too easy to overlook or make unwarranted assumptions about barriers to consumer action, such as concerns about taste, convenience, or substantiation. If those barriers are not addressed with well-thought-out assurances, they can easily disrupt communication that is otherwise successful. Published by Insights Associations, our Senior Manager, Scott Garrison discussed specific research into triggers and barriers which can reveal persuasive reassurances that convince consumers. “As an example, a consumer may develop an interest in a light ice cream because it promises less sugar and fewer calories (triggers) while simultaneously feeling uncertain about its taste (barrier). This doubt may be strong enough to prevail over the appeal of the health benefits and ultimately prevent purchase. However, if the brand communication focuses on taste, the barrier is addressed and the consumer’s mind can be set at ease. Step 1: Identify potential triggers and barriers regarding your product. If your fellow employees have sufficient market and consumer knowledge, this can be done collaboratively within your company. Alternatively, the research strategies outlined below can be used to discover the most relevant triggers and barriers. Step 2: The importance of each trigger or barrier is quantitatively validated. This process will bring to light the proportion of the market that is predisposed to particular triggers or barriers and which are therefore the most important recipients of communication efforts. Step 3: Consumers identify the reassurances that can help them to overcome barriers to promote an initial trial or increase usage. After all, it may not matter how many reasons to purchase the product are provided if key issues are addressed and resolved. 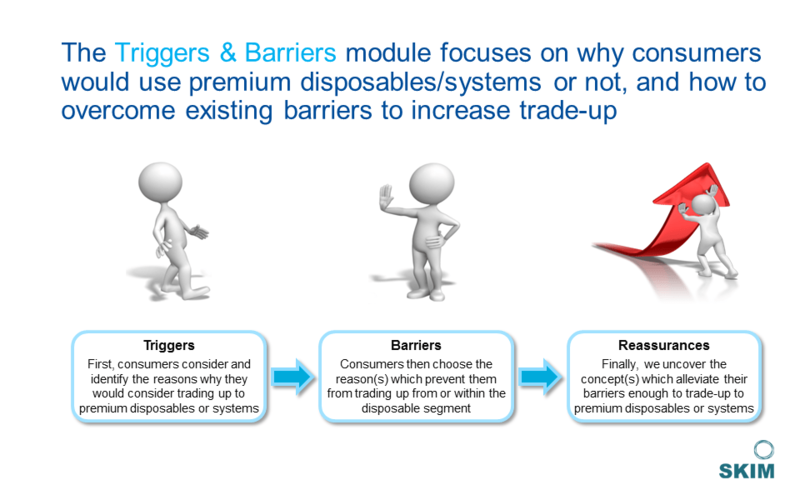 Download the full article on triggers and barriers research in PDF.